It’s been over a month and our carbon/biochar and Korean Natural Farming inputs trial at the Transition Wayland plot in the Community Gardens has been running smoothly. Yesterday we harvested for the first time and the differences between the four beds are already noticeable! 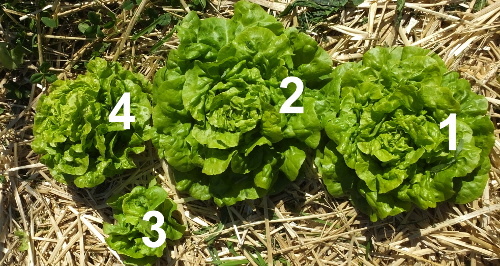 Check out the five lettuces we transplanted in May. The nice, loose soil in the long bed that makes up beds 1 and 2 is obviously much better than the tight soil in beds 3 and 4. The KNF has been of benefit in both, a smaller benefit in the loose soil beds (2.3 ounces heavier), and a much larger benefit in the tight soil beds (the KNF lettuce there was a whopping 10.6 times heavier than in the no KNF bed). So the KNF overcame whatever the deficiencies are in that soil. This larger benefit is less pronounced, but still visible for all the other plants (chard, beets, peppers, tomatoes, tomatillos, broccoli, onions and parsley). Those in Beds 3 and 4 (tight soil) are obviously smaller than in Beds 1 and 2 (loose soil). There is less of a noticeable difference between Beds 1 and 2, but again more of a difference between 3 and 4. So again the KNF shines in overcoming a tight soil. Of course, these are only our first data points! We’ll keep measuring and recording – and eating – all season long. Can you see we’re having fun? Im doing a side by side test for salad in vietnam. We are going to compare conventional method vs korean natural farming. Im wondering if you had any comments and if ypu had taken notes of your process…i want to male sure my first test works well so that we can get more vietnamese farmers and n board!